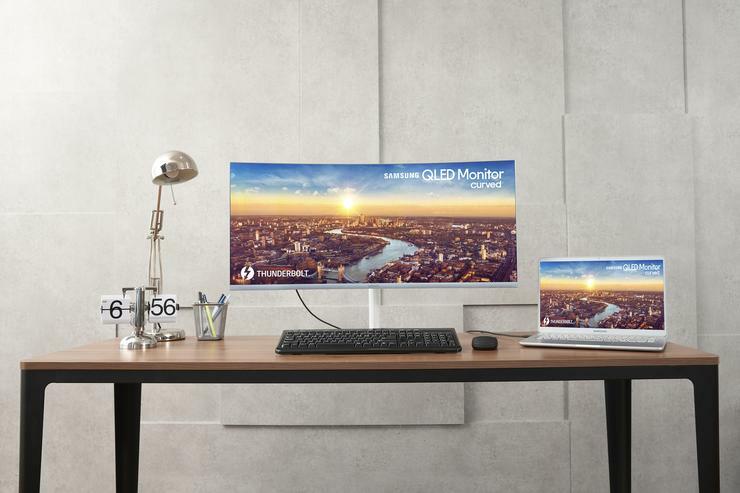 Kicking off this year's IFA with a bang, Samsung has announced the new CJ79, the company's first Thunderbolt 3 QLED curved monitor. Claudio Cardile, Head of Visual Display at Samsung Electronic Australia says that “At Samsung, we’re dedicated to giving Australians the best possible viewing experience, whether for work or play. By combining Thunderbolt 3 connectivity with our best-in-class curvature and stunning QLED picture quality, we’ve developed a display that will improve productivity and deliver a more immersive entertainment experience for Australians." “As a leader in the curved monitor space, we’re always pushing to find new innovations and refinements that keep our products at the forefront of display technology, and the CJ791 is our most advanced and elegant display yet.” said Cardile. According to the company, the 43-inch CJ79 curved monitor "incorporates Quantum Dot technology with brilliant and realistic detail across a 125 percent sRGB color spectrum." The monitor also boasts a 3000:1 contrast ratio, FreeSync support, a built-in KVM switch, USB-Type C ports and built-in stereo speakers. Samsung’s Thunderbolt 3 QLED curved monitor, the CJ79 will be available in Australia from September 3 with an RRP of $1599.